This free workshop will focus on the use of woody energy crops grown in short rotation plantations to provide fuel for heating whole villages. The day will feature presentations on growing short rotation coppice and short rotation forestry, plus examples of best practice. 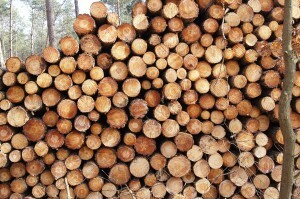 There will also be a chance to see Dartington’s short rotation forestry plantations. For further details, and for registration, visit Crops4Energy. Visit homes and gardens in Totnes, Dartington and the surrounding areas at different stages on the journey to reducing environmental impact and household bills. . The programme gives details of the 18 homes and projects, including several renewable energy installations – the South Brent wind turbine, the Totnes Weir hydro scheme and the new field solar and biomass boiler at Dartington Trust – open over the weekend. Learn about the opportunities locally for wood fuel, managing hedges for fuel, food, farming and wildlife. Farmers, landowners and people with wood-burners working together. 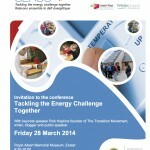 Free event organised by the South Devon Coastal Renewable Energy Network. All welcome, booking essential. Flyer available here. Sustainable South Brent are pleased to announce the first ever South Brent Wood Fair, at the Village Hall, on Saturday 13th September 10am-5pm. This FREE family friendly event includes over 30 stalls, activities and events, with lots to see and do, plus delicious food and a bar. 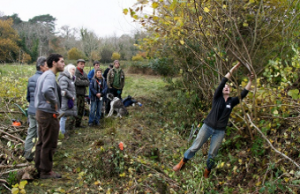 The Wood Fair has been organised by South Brent Steepers, a group of volunteer hedgelayers who were born out of the Woodfuel from Hedgerows initiative led by Dartmoor Circle. Devon Hedge Group, alongside Sustainable South Brent, are providing interactive stalls packed with information about wood fuel and about energy use, with quizzes to test your knowledge and raise awareness. Everything to do with woodfuel will be explored, from chunking to chimneys, from stoves to seasoned fuel. Dartmoor National Park, Devon Wildlife Trust and Orchard Link also have stalls and there will a spectacular pole lathe turner and a fascinating charcoal burner. There will be opportunities to try your hand at willow sculpture, basketry, felt-making and spoon carving. There will be special activities for children, plus a chance to go foraging for wild food as well enjoy the amazing array of delicious treats provided by local team Two Good Cooks. The bar is supplied by the team from The Oak, South Brent’s popular pub. The Woodland Trust will be giving a guided tour of Penstave Copse with their new manager and woodland expert, Paul Allen. Entertainment on the day includes Organic Poetry from Jackie Juno (The Bard of Exeter), Earthwalks with the Wandering Minstrel, performance from Rooh Star and music from Half the HOt House Band and Mick Bramich, plus storytelling with the enigmatic Crow Show. To top it off visitors can enjoy relaxing foot massage with Meaningful Soles. And remember – there is FREE entry to this spectacular family event! There is no parking on site, so please park with consideration, within the village. Dogs must be on leads and children must be accompanied. Seventeen householders across the area are opening their doors on Saturday and Sunday 13th and 14th September from 10:00 to 16:00 … to share with you how they are conserving energy or generating it from a renewable source. Information on the Individual homes can be found here. There are five bus tours to choose from and a walking tour. If you don’t have transport, or would like to visit homes with others, please fill in the booking form. Meet exhibitors specialising in energy conservation, renewable energy, woodfuel, planning, grants, electric vehicles and more at Tavistock College from 10am – 4pm. There are practical energy saving talks, things for thechildren to do and light refreshments available. It’s also a chance to support Tavistock College’s Solar Schools Campaign. We’ll be treated to a performance by Matt Harvey, poet in residence at RegenSW. A list of the exhibitors, talks and workshops can be found here. Any questions please email info@transitiontavistock.org.uk or call 07969-569-444. 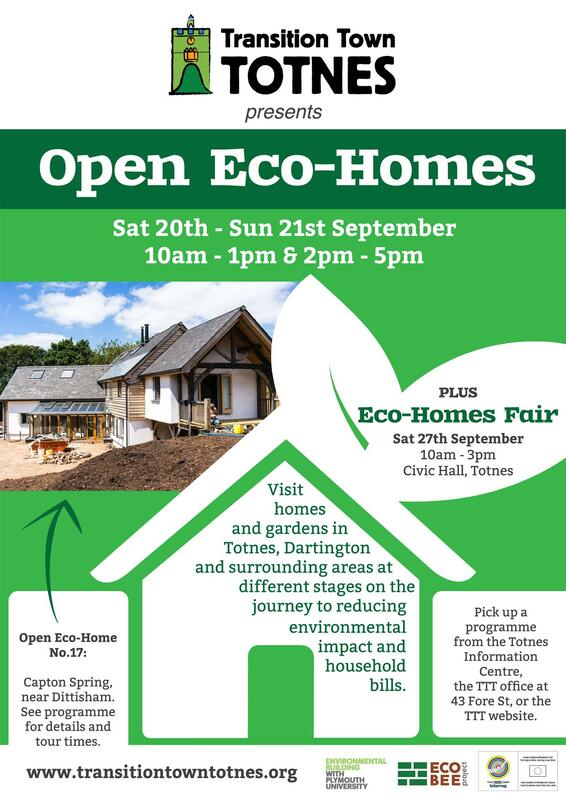 For the 6th year running Transition Town Totnes is holding an Open Eco-Homes Weekend, featuring homes, buildings and gardens that have taken steps to reduce their environmental impact and household bills. This year’s event is on Saturday 20th and Sunday 21st September and involves 18 exciting homes, buildings or sites. Some are opening again by popular demand, including The Cob House , a passivhaus refurbishment, a straw bale house, a house made from an old cider barrel and the Landmatters Permaculture Project. There are also several properties that have not previously taken part, including an excellent example of draught-busting an old building, a 1970s bungalow refurbishment and two newly built homes. It is a great opportunity to find out from the householders and/or builders about challenges, successes and failures and about different materials and technologies, including natural building materials, eco-toilets, biomass boilers , heat pumps , solar energy and electric car charging. Find the programme online at the TTT website. To accompany the Totnes Open Eco-Homes event there is an Eco-Homes Fair on the following Saturday at the Civic Hall, Totnes, 10am – 3pm. With rising energy bills and the wish to cut carbon emissions high on many people’s personal agenda, the need for sustainable, energy efficient buildings is increasingly urgent. The Society for the Protection of Ancient Buildings presents a unique one day course on how to make your home – whether it is medieval and timber-framed, Georgian, Victorian or Edwardian, detached or terrace – energy efficient and low carbon without devaluing the future sustainability or character of the building. Come along to the Museum of Dartmoor Life to see this exciting, interesting and FREE exhibition; learn about the achievements of your local college, their international acclaim and also how you might be able to follow in their footsteps and save money! 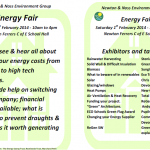 Come along and see if you can find ways to reduce your energy bill. All donations received on Saturday will go to helping the museum become more energy efficient by purchasing LED spotlight bulbs to replace the current energy hungry bulbs. Currently each light uses 50W and could be replaced by a 5W LED light saving 90% of the running cost. There are hundreds of these to replace in the museum. What’s the home energy assessment for? Energy monitors and the energy use of different appliances. Energy efficiency for traditional buildings – many local houses are old and hard to insulate, with solid walls, brick or cob, thatch, traditional windows etc. This session brings advice from English Heritage and other sources for making older houses cosier and cutting bills. For further information visit Moretonhampstead Energy Savers. Over the past three years the SEACS project has tackled the challenge of reducing energy consumption. The conference will be of interest to anyone involved in reducing energy consumption but particularly those working with schools and communities. The conference will start with a presentation by Rob Hopkins, founder of The Transition Movement. The day will focus on the successful methods and tools that have been used by the project partners in south west England and Brittany to assist individuals, householders, communities, schools and local authorities to change their behaviour and implement sustainable energy measures in order to reduce energy demand. This conference will provide a stimulating environment to learn of new tools and approaches as well as an opportunity to network and share with others your own practice when tackling the energy challenge. Book a place on this free conference. 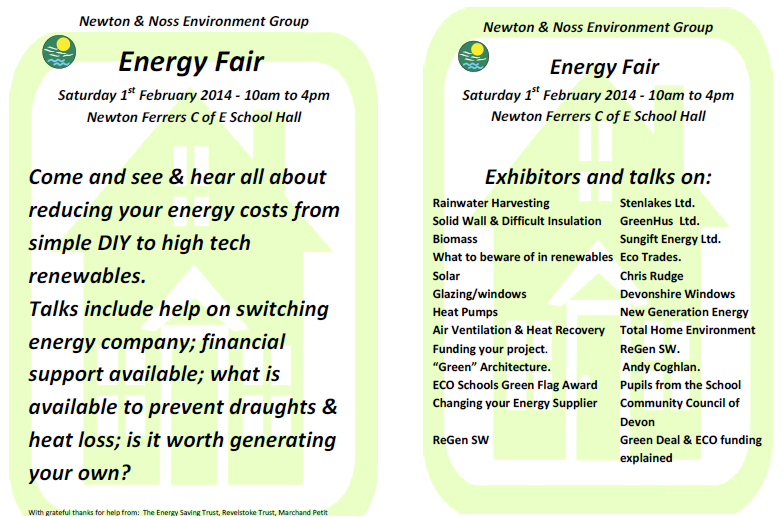 Newton and Noss Environment Group Energy Fair at Newton Ferrers C of E School. Talks and trade exhibitors will be on hand help you with advice on energy-saving ideas to keep you warm, and your energy costs down. 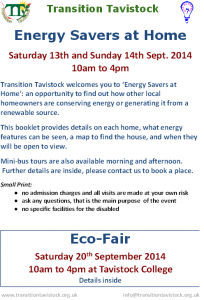 Transition Tavistock welcomes you to our Energy Savers at Home fortnight. 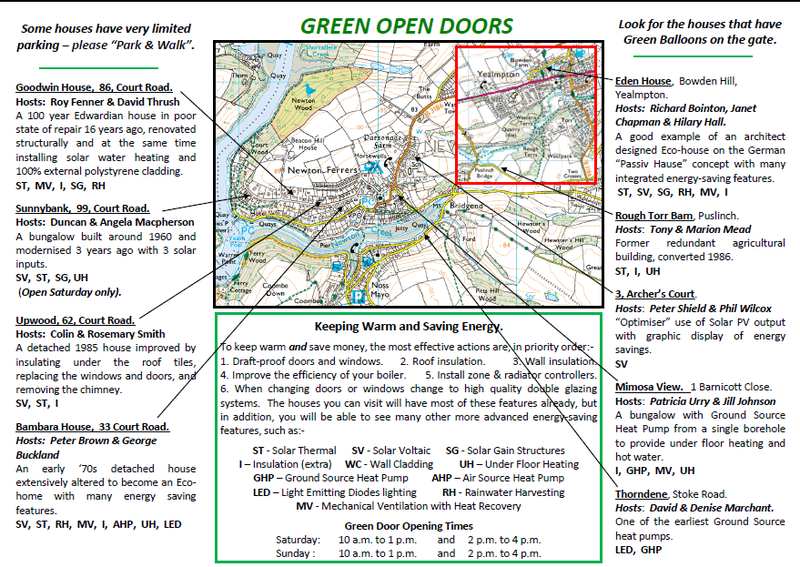 Fifteen householders across the area are opening their doors from 10:00 to 16:00 to share with you how they are conserving energy or generating it from a renewable source. Energy Savers Eco Fair at Tavistock College. Meet exhibitors specialising in energy conservation, renewable energy, woodfuel, planning, grants, electric vehicles and more. 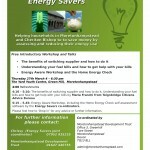 There are practical energy saving workshops, things for the children to do and light refreshments available. It’s also a chance to support Tavistock College’s Solar Schools Campaign. 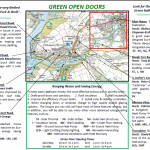 Newton and Noss Environment Group with generous support from the Energy Saving Trust and Revelstoke Community Trust, invite you to Green Open Doors. Visit local houses that have installed a variety of energy-saving, and money-saving, environmentally-friendly features. Meet suppliers of eco-friendly goods and services plus home energy installers and eco-builders at Transition Totnes’ trade fair. Visit homes and gardens in Totnes, Dartington and nearby at different stages on the journey to reducing their environmental impact and household bills. Organised by Transition Totnes. Devon’s County Hall played host to our launch event on the 4th March 2013. The Partnership, representing the local authorities and communities in the South Hams, West Devon and Dartmoor National Park areas, welcomed delegates from across the county to hear inspirational presentations from the leading lights on energy issues in the South West, and discuss how to localise energy for economic benefit. This launch was held to introduce SWD CEP to organisations, authorities and groups throughout the county and the wider South West. It also acted as an opportunity to celebrate community energy action and gather information on opportunities, projects and schemes in the South West Devon area around sustainable energy to help reduce consumption and build resilience. Download the full SWD CEP Launch Summit Report.